For many professionals, speaking at conferences is a single means to an end – create awareness about your expertise and attract inquiries. To me, that singular view can be productive, but misses a tremendous amount of value that can be gained from conference speaking, especially where the audience includes people in your target market or industry. From prospecting new clients to recruiting new talent, conferences provide a variety of ways to advance business goals. One approach in particular, provides abundant optimization opportunities. Of course that one thing is content creation. With a little planning, a single 3 day conference could generate a month’s worth of content for a mid-sized business blog. Here are a few ideas for you, which can serve as a great foundation for the kind of content that can be amplified through the advice you’ll find in Optimize. Take notes from the sessions and write up articles for your own site or pitch them to other blogs. I recommend prewriting an outline so that you can either liveblog the session or at least get a head start on the article. Being first is important if you’re pitching a conference article to an industry publication. Use your camera and do some informal video interviews on a tour of the exhibit hall and see if booth staff are willing to give a 30 second pitch. Post those interviews to YouTube, embed in your blog, post to Google+ and Facebook. Be sure to ask questions using your own target keywords so the answers help support the topic. Transcribe the audio to text when you embed the video interviews on blog posts or on your website. Make a Pinterest board or a Set on Flickr and post conference photos. Create a group board just for the conference and invite others through the conference hashtag to join you in curating conference images. Everybody wins! Listen for quotes, tips, tools and statistics, then create lists posts (45 Tips on Conversion Optimization, 23 Things You Didn’t Know about customer segmentation, 15 Essential Statistics About Online Advertising). Create your own hashtag, and livetweet sessions during the event. Then compile those tweets into daily roundup posts “45 things I learned at conference XYZ”. Add those single tweets (quotes, tips, statistics) to interesting images (1 tip per image) and post them to Facebook, Pinterest, Instagram and share via Twitter and the conference hashtag. Pitch the conference blog with an article about one or more of the sessions you attended. Make sure it’s high quality, cited and proofed with an excellent photo of the speaker and audience. Ask the speaker for a copy of the PPT so you can use a few of the slides in your article. Promise to link to the speaker’s blog as incentive. Create a PowerPoint presentation from your notes about the sessions you attended for: internal company training, client training or for your own use when speaking at an event. You could also write a long article and break it up into smaller blog posts. If you’re a speaker, you could take your PowerPoint presentation and break it up into multiple blog posts or articles. Use photos and videos taken at the conference for your own social media promotion of your blog and company’s services or at least as stock images for blog post and b-roll for video. Create an image or video destination for the event, organized by topic. There’s a lot, lot more you can do to leverage conferences for content creation, including conferences eBooks. If your company wants to learn how or needs help with getting more creative and better performance from content marketing, connect with my agency or me here and on LinkedIn. 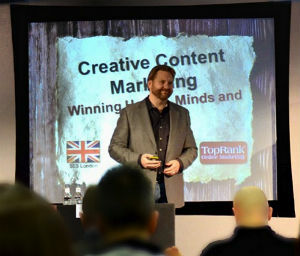 If you have some creative ideas about leveraging conferences and speaking events to create great content, please share. The best idea wins a copy of Optimize. These are all great ideas, Lee! My colleague is heading to SXSW and I’ve passed your article along to him for reference. He’s going to try to do as many of these as possible while he’s there. Love the idea of a Pinterest board for images. Another idea that I think is a great tool for building engagement amongst conference goers is a photo caption contest via social media or on your blog! We did one in the past when we attended Internet Summit 2012. It’s fun, easy, and gets people to interact with you.